Pulling up to a spot, checking the surf and seeing it going silly and knowing that you will be a part of that as soon as you can get out there. Your mind is instantly clear and nothing else matters. Just like being a kid again with no worries. If it's not looking so good, I sometimes stand there and think, what if. What if it was bigger, what if the wind switched, what if that sandbar shifted this way, what if it was just me and a couple of buddies out. I do the same thing when painting but I can make those what ifs a reality. Rick Tontz was born in Bossier City, Louisiana, in 1970, where his father was stationed in the Air Force. 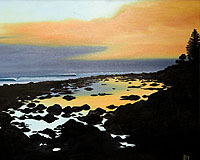 The family moved to California, where Rick spent his growing-up years in Los Angeles. 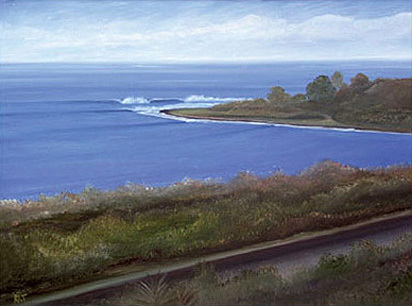 As a young teenager he took up surfing, and formed a strong connection with the ocean, which became his escape from the rat race of the big city. 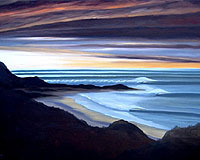 This strong connection with the the ocean led him north to Santa Barbara, where he could enjoy surfing and a slower and more grounded lifestyle. At Santa Barbara City College and UC Santa Barbara, he studied geography and art -- two of his strongest passions, which are reflected in his art today. Seeking an outlet for his creative energy, Rick indulged in a five-year obsession with pottery. 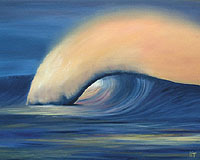 A friend and painter turned him on to the idea of marrying his creative energy with his passion for the ocean. He'd always been drawing the things that interested him, and now switched his focus to the fluid medium of paint. 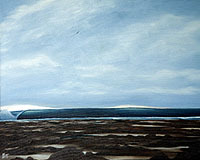 Painting has been his artistic focus since 1997, using both acrylic and oil. Rick's studies in geography exposed him to computer graphics, and a job in the computer mapping field - a combination which led to a professional artistic outlet as a web/graphic designer. Since 1997 he has operated Logan Dzyn in Santa Barbara, where he has designed web sites and marketing materials for a variety of local, national and international clients. 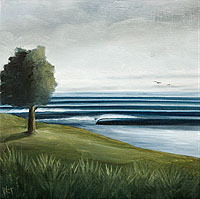 Most of Rick's paintings portray the universal surfer's dream, the perfect wave, the perfect day. 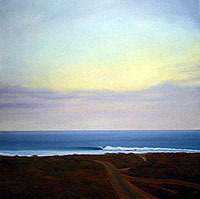 Many of his pieces are inspired by his surfing experiences over the last 25 years along the coasts of California and Mexico. 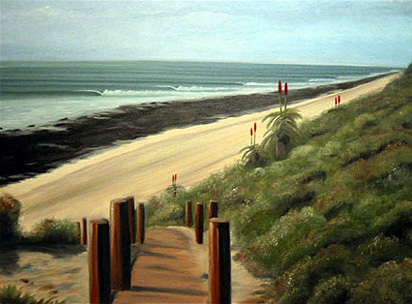 His paintings are inspired by his surroundings, from classic point breaks to sunset vistas along the coastal landscape. As he has matured as an artist, he's explored organic abstract expressionism, influenced by artists such as Pollack, Rothko and Kline. But the ocean remains his home, and the source of his joy in sharing his dreams with others.